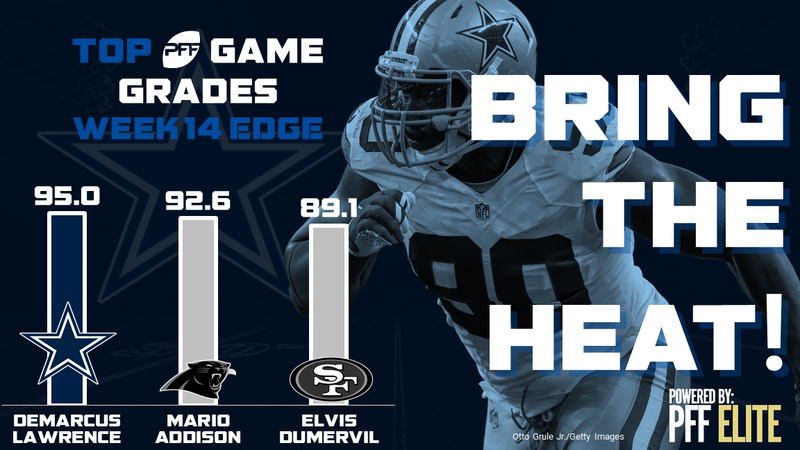 Demarcus Lawrence, Dallas Cowboys, 95.0 game grade – Lawrence was a menace both rushing the passer and defending the run. On 31 pass-rush snaps, he racked up seven total pressures, including a hit on the quarterback. While in run defense, Lawrence made two run stops and was disruptive all day. Mario Addison, Carolina Panthers, 92.6 game grade – Addison enjoyed his best game of the season this past Sunday. He was the easily the best Panthers defender and played a big role in the team’s huge win over the Vikings. His eight total pressures led all 4-3 defensive ends. He also notched two tackles resulting in a defensive victory while defending the run. Elvis Dummervil, San Francisco 49ers, 89.1 game grade – Dummervil took full advantage of the maligned Houston Texans offensive line, producing one of his best games on the season himself. Playing primarily on passing downs, Dummervil got pressure on one third of pass-rushing snaps, registering eight pressures on just 24 pass-rush snaps, including two hits on the quarterback. Cameron Jordan, New Orleans Saints, 89.0 game grade – Continuing his top-notch season, Jordan put up yet another great game. He was excellent rushing the passer, racking up five total pressures, including three hits on the quarterback. Jordan was also disruptive against the run, where he produced two run stops. Heading into Week 15, Jordan is tied for the top grade among edge defenders. Robert Ayers, Tampa Bay Buccaneers, 88.2 game grade – Despite his team losing a tight game this week, Ayers led the Buccaneers defense putting up a huge game. He hit the quarterback three times on his six pressures, which tied for the most hits this week. While only defending the run on 14 snaps, Ayers managed to produce two run stops.